Traditional celebrations of the first of May include leaving a basket of flowers at your neighbor's door. 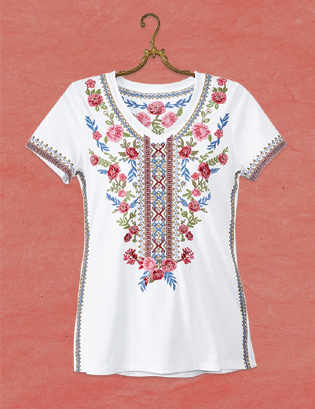 This top brings the freshness of a spring morning - embroidered flowers blooming alongside a geometric basket-weave pattern on soft white cotton jersey. Approx. 27" long. Imported. Cotton; handwash. Sizes S-XL.